Originally published in the Imperial Magazine in June 2017, Professor Naomi Chayen explains why, when it comes to medicine, crystals may indeed have magical properties. To grow a crystal used to be considered a kind of magic. Perhaps that’s because crystals are so beautiful: it is easy to understand why so many people are fascinated by them and believe that they bring good fortune, or have healing powers. And yes, they do have powers. 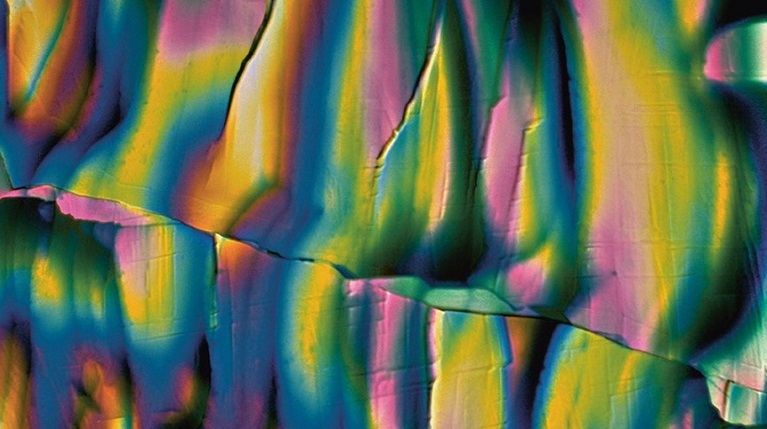 Crystallise a substance – a protein, for example – and you can understand its structure. 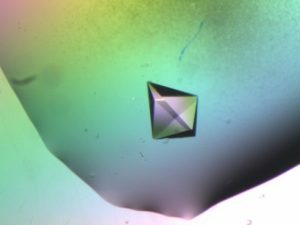 We prize diamonds for their beauty: I prize protein crystals for their potential power to unlock new treatments, in everything from cancer to diabetes. They are my diamonds. My own involvement with crystallography was a happy accident. I was encouraged into the field by one of its great pioneers, Professor David Blow. At that time, growing a crystal was regarded as more of an art than a science. There was a sense that one had to have ‘green fingers’, like a gardener: knowing the basic components of success but also using some kind of indefinable sixth sense. I became fascinated with them. I wanted to bring scientific fundamentals to the process and create crystallisation methods that would work all over the world, from Kathmandu to Tokyo. Of course, crystallisation is not new. In 1914, Max von Laue won a Nobel Prize for his discovery that X-rays could be diffracted by crystals, making it possible to work out their structure. In those early days, there was a great rush to crystallise as many things as possible. Any substances that were simple to crystallise, were crystallised. All prescription drugs on the market today, accounting for billions of pounds in sales, directly or indirectly target proteins. Proteins are responsible for many of the body’s functions such as oxygen transport, food digestion, muscle movements and many more tasks. And disease often occurs due to the malfunction of proteins. Once the human genome was sequenced, the need to crystallise became more urgent than ever, as for the first time there was an exponentially increasing number of proteins that could be identified as potential drug targets. But there was a bottleneck. The crystals that they needed could not be produced at the required quality. Each protein has a different role. Its three-dimensional shape, or structure, determines this role. In order for a medicine to be effective, it needs to know what this role is, as it needs to target the specific protein that is involved in the disease that is being tackled and influence its activity, by either blocking or enhancing it. To achieve this, we first need to know exactly what the protein looks like – in other words to determine its structure. It’s a bit like looking round a room in order to give the right task to the right person: there’s no point asking the shortest person in the office to reach down a book from the highest shelf. The most powerful method for determining the structure of proteins is X-ray crystallography. In their natural state, proteins – in the blood, for example – are liquid. Unlike solids, which have a definite shape and size due to orderly arrangement of their molecules, liquid proteins are hard to visualise. Hence, in order to enable us to visualise their shapes clearly, we need to change the proteins’ liquid state to semi-solid. In other words, into a crystal which can then be X-rayed. But there’s a problem: this method is totally reliant on the availability of high-quality crystals – and they are very hard to produce. Crystals of proteins and other biological molecules are particularly difficult to obtain. This is because they are very large molecules consisting of millions of atoms, and the crystallisation process depends on many different factors. Most proteins of interest are limited in supply (less than 1mg). Most importantly, proteins are biological materials, sensitive to external conditions. They cannot be made to form crystals by the harsh means that are applied to producing crystals of diamonds and gems, such as high pressures or high temperatures. Meeting this challenge is where my lab comes in. Our first strand of work is to develop a fundamental understanding of the crystallisation process and exploit this to design practical methodology for producing high quality crystals of medical and industrial interest. The second is crystallising target proteins to determine their structure and enable rational drug design. At the moment we are working on the crystallisation of proteins related to cancer, HIV, diabetes and heart disease. Our latest breakthrough was around nucleants. Growing a crystal requires tender conditions, similar to the formation of a baby. In the first stages of growing new life, two molecules are brought together and, if they connect well, you get a healthy embryo which then turns into a healthy baby. But if too many molecules come together – which can happen during in-vitro fertilisation (IVF), for example – they may compete with each other and lead to difficulties. So when it comes to crystallising proteins, success lies in being able to control the ‘conception’ stage of the process, applying materials that induce nucleation and formation of crystals. These nucleants can help the crystallisation process by serving as an anchor or template for the protein molecules to stick to and gather around. Early nucleationinducing materials were based on a process called epitaxy – electrostatic attraction of the protein molecules by oppositely charged surfaces – or attempts to increase the contact area between the crystallisation solution and the surface. These approaches had limited success. In setting out to find a nucleating agent that would work via a completely different mechanism, I introduced the idea of designing nucleation-inducing agents that contain pores of similar sizes to those of protein molecules. The pores entrap protein molecules and encourage them to coalesce in crystalline order. Porous materials have worked well and have set a trend in the field. Building on the success of such porous materials, in particular a specifically designed bioglass (patented and commercialised under the name of ‘Naomi’s Nucleant‘), we sought to design nucleants with improved specificity for protein molecules while maintaining the idea of harnessing pores. We discovered the existence of polymers imprinted with proteins (MIPs), also referred to as ‘smart materials’. Molecular imprinting creates polymers formed in the presence of a molecule that is extracted afterwards – leaving behind cavities imprinted with that molecule. The cavities in the gel retain a memory of the molecule after it is removed and exhibit highly selective rebinding of the given molecule. In collaboration with the University of Surrey, we had MIPs imprinted with a variety of proteins, and experimentally found, as we had hypothesised, that the cavities acted as templates for crystal nucleation and facilitated crystal growth. This has led to a second patented product, commercialised by Imperial Innovations, by the name of ‘Chayen Reddy MIP’. In the past 15 years, there has been momentous progress in the miniaturisation, automation and analysis of crystallisation experiments. 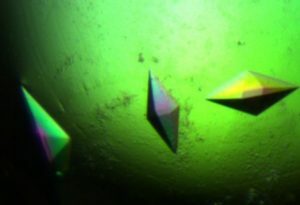 X-ray beams have been developed, for example, that can X-ray tiny crystals, and I have been involved in several pioneering aspects of protein crystallisation, such as the development of nano-scale crystallisation procedures, robotics and the design of screening and optimisation techniques. 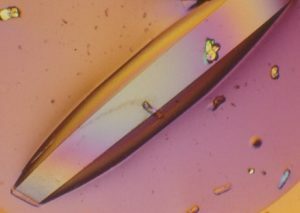 The research has established new concepts in the field and unique ways of producing crystals, making experiments more efficient as well as saving time and materials. The new methods have resulted in successful crystallisation, leading to the structure determination of numerous proteins, including membrane proteins and large macromolecular complexes that had previously failed to crystallise using conventional techniques. I have also sent experiments into space with NASA, the European and Russian Space Agencies and on the International Space Station. With no distractions – such as gravity, which pulls them down, and convection, which makes them mix – crystals can grow more effectively. Yet producing useful crystals still remains a major barrier to progress, but we’re continuing to develop rational approaches to find new ways of overcoming this problem. Nowadays labs conduct crystallisation trials mainly using robotics, so any methods that we design need to be adapted to automation and high throughput mode. For me, the really big question of finding that magic bullet has yet to be solved. I know that we will continue to be inspired by the structures that we prize so highly: after all, the expressions ‘crystal clear’ and ‘to crystallise thoughts’ stem from our science. Just like the crystals that provide atomic structures, our initial thoughts are jumbled. Yet as they gradually come together in an ordered way, we then begin to see the whole picture and understand what is going on. Professor Naomi Chayen is Head of the Crystallization Group in Computational and Systems Medicine at Imperial College London.